When I think of Paula White - renowned life coach, bestselling author, motivational speaker, and host of her inspirational TV program Paula Today - I think of reaching for seemingly “impossible” dreams. She is a woman famous for her messages on hope, transformation, and not allowing your past to dictate your future. No stranger to the pulpit or stage, she has had guests on her show such as Donald Trump and Elder Bernice King (daughter of Martin Luther King Jr.) as well as having graced the stages of the Larry King Live and the Tyra Banks Show. She has captivated the hearts of America and her testimony and influence has spread across the earth like a sweet fragrance. White ministers to everyone from Hollywood to the homeless. I run out of breath just talking about all that she does; not able to fathom actually doing it all. But where did all of this begin? Have you ever wondered if, as a young person, White had any inclination or feeling that she would be doing something so big? She laughed for a moment, reminiscing on the fact that she used to think the people lived in the TV and would talk to you. Shortly after hearing the gospel for the first time at age 18, the Lord gave White a vision of her purpose. Every time that her mouth opened, she saw multitudes of souls saved - but when she shut her mouth, they fell into darkness. This vision propelled her forward into the call of God, no matter what the cost; even when that meant moving her family from Washington D.C. to Tampa, Florida to start a small church in a storefront. The ministry drove around the city streets, putting on Nickelodeon type shows to share the gospel with anyone who would listen. “I simply had a passion to find my purpose and follow it,” White explained. Over twenty years later she finds herself traveling the world, preaching the gospel on a much grander scale. April 22nd brought her to Cornerstone Harvest Church - a church in southern Ohio, surrounded by cornfields. The topic of the night: Vision. An enthusiastic crowd awaited White’s message, which followed anointed, uplifting worship, as well as a powerful skit done by the youth. This past year has been quite a year for White, including everything from receiving the Humanitarian Award at the 2009 Trumpet Awards, to co-hosting the 2009 Gospel Today 20th Anniversary Celebration, to recently arriving home from a mission trip in the Ukraine with Pastor T.D. Jakes. This success, coupled with being under the media microscope while dealing with her own set of personal heartbreaks, created somewhat of a bittersweet mix. Even still, she relentlessly continues to focus on the positives and the call of God upon her life. As cliché as it sounds, when life handed her lemons, White made some sweet lemonade. In October of 2008 she turned around, releasing her book Move On, Move Up: Turn Yesterday’s Trials into Today’s Triumphs. Her testimony, born out of many tears, tests and trials, proves Romans 8:28 true - God does work in all things for the good of those who love Him. Though many would presume the excitement of awards, success and the spotlight would make her eyes sparkle with the most joy – they aren’t. “Sometimes people expect all of the wonderful things to be the Trumpet Award and accolades, but I’m really just the girl from Mississippi that was very, very lost. I had abandonment issues from my father’s death and was sexually and physically abused,” she said. It was hearing the gospel for the first time at 18 years old that changed her life. “That life transformation produced a prayer in my life where I asked ‘God can I spend the rest of my life helping people?’ And I think some of the great accomplishments to me might be little things to other people, but the fact that every day in some way maybe I can hug someone, speak a kind word to someone, feed somebody a meal, preach the gospel, or encourage someone on Facebook,…” she said, smiling. The entire purpose of the Trumpet Awards is to acknowledge the accomplishments of men and women who have significantly contributed to enhancing the quality of life for all. This year White received the Humanitarian Award. 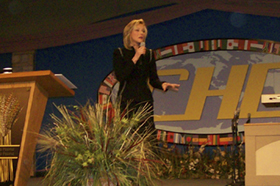 Paula White Ministries has built orphanages around the world, education centers, impacted the inner city and transformed many cities from coast to coast. They have their Back to School Bash, feed the homeless, work in the Appalachians and the list goes on and on. Most recently the ministry supported CeCe Winans’ Always Sisters Girls Conference, “To help young girls find their destiny, meaning and value through the Word of God,” White said. “So the honor of receiving that, not so much for myself, but as the representative of Paula White Ministries and the many partners, gave value to our voice of what we do on a daily basis and was beyond what I can articulate,” she said. White’s life prayer began, as mentioned above, at just 18 years old. “So maybe no one will ever know you as a worldwide household name or hero, but he is one of the greatest heroes to me because, had he not shared the life of Christ and the gospel and good news, where would my messed up Mississippi life turned out to be? So I encourage you - you make a difference. You keep going and know that heaven has your reward.” Amen! EUTOPIA: When you have a day off, what are some of your favorite things to do? Paula White: I read. I have a variety of books, a lot of psychology books - I’ve almost finished my Masters in Psychology. I’m actually reading one now called Perfect and it is on breaking perfectionism. I’ll read spiritual books obviously. I like biographies, some history. I’m not much of a fiction reader; I’m more into life application, life stories, and autobiographies…things like that. I like to antique, horseback ride in the summer, ski in the winter and work out every day. EUTOPIA: So you’re pretty active? PW: Always, always. I was an athlete growing up. PW: You’ve got it! I’ll go out, get on a Harley every once in a while. Little things. Sit out by my garden. EUTOPIA: Do you have time to garden? PW: I make time. The landscape of my life has changed and I’ve learned to breath. I’ve learned to value things. There were seasons of complete drive that I was just so overwhelmed with the call of God, but now I’ve learned to live a more balanced life. EUTOPIA: What are some of your favorite music artists? If you have an iPod what is on it right now? PW: Kings of Leon. We just went to their concert at Madison Square. And I’ll listen to anyone from Rascal Flats to Keith Urban. Music to me has a lot to do with mood. I was listening to Norah Jones and Tony Bennett this morning. I think I have 400 albums in my music system right now so I have a little bit of a variety…just about everybody. PW: Different things at different seasons and times have inspired me. Again, I think people would be surprised; it’s often the little things in life. Today I was inspired by Brittany McCann who was in service. She was in a wheelchair; she suffers with cerebral palsy. Sometimes it will be so painful that she will bite her pillow for 20 to 30 hours at a time, screaming, because there is so much pain racked in her body. She will drive four, five, six hours, if I am anywhere in proximity. Brittany collected teddy bears all of her life and when hurricane Katrina hit, she sent them to me so that I could distribute them to the children in the shelters in New Orleans. No one will probably ever know Brittany McCann’s name, but what inspires me is seeing a girl that it probably took her all day to get here, come here with joy unspeakable. And I think ‘how can I complain and feel some of the pressures that I feel in life’? People’s stories inspire me, my friends inspire me; it just depends. EUTOPIA: Are there any other preachers that inspire you? PW: Bishop Jakes is my spiritual father. We just came back from the Ukraine with him. He is a great man of God. He has been a part of my life for over 20 years and he and First Lady Jakes have always been a great inspiration; not only what people have seen publicly, as far as the platform, but I’ve had the privilege of knowing the man, the friend, the incredible father, husband, the courageous, honorable, sharp business man, teacher, mentor… and I’m inspired because I know not only where he’s gone with determination and the declaration of the Lord, but I know where he has been and that’s always inspirational to me. EUTOPIA: You have accomplished so much already, but do you have any dreams for the future? Is there anything left that you haven’t done that you want to do? PW: Oh see, I think there is so much to be done. Every year we do our creative meetings and our creative meetings consist of ‘what is God speaking and where are you going this year?’ and for 20 some years I’ve said the same thing. I’m doing exactly what I’ve done for 20 some years and that is that we are preaching the gospel every single day and that is bringing spirituality in a very relevant way to help someone, to empower someone and to restore someone. I put it in a simple phrase of ‘changing lives, transforming hearts and saving souls’. So the capacity has enlarged. It might have been with a hand full of people 20 years ago, but now God has given us the responsibility for nations. So we don’t change our mission, but we have been able to reach further. I think consistency is the key to do what God has called you to do and that is just every day doing the same thing.